Triple Breakout Test In Play For S&P 500! The markets turned sour overnight as Trump threatened more Auto Tariffs and the US targeted Huawei in a criminal probe of stealing trade secrets and Goldman Sachs warned that we may lose a full point of GDP as rich people spend less in 2019 – because they didn't get another huge tax cut on top of last year's. Apparently, we have to give the Top 1% bigger and bigger tax cuts every year to drive our economy or maybe (as is being pushed by the Cortez Democrats) we need to rethink the whole system and go back to NOT relying on rich people to drive the economy and stimulate the bottom 90% instead. I know – CRAZY! Multimillionaires would certainly lose money under AOC’s tax proposal. How much does that matter? Economists typically appeal to utilitarian reasoningto argue that it matters very little: The superrich can buy nearly anything under the sun either way, so a few hundred grand here or there has a negligible effect on their well-being. And just 16,000 Americans make more than $10 million per year—they’re literally the 1 percent of the 1 percent (0.05%, to be exact) — making any negative impact of the tax even tinier. 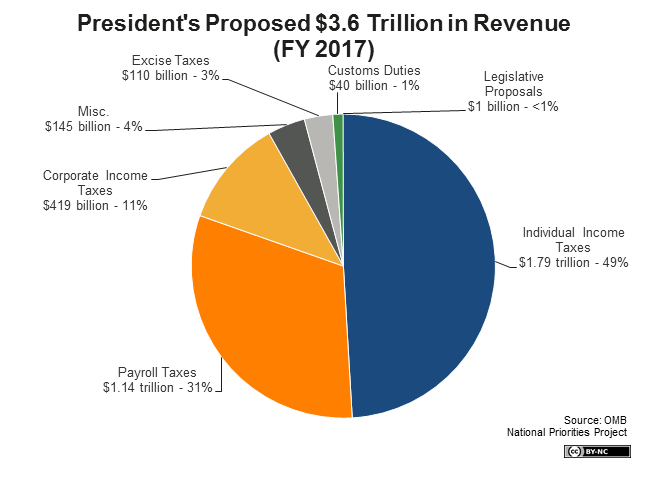 As usual, we're missing the boat because the real money the Government isn't collecting is from the Corporations, who made $9Tn last year and paid just $419Bn (4.6%) in Federal Taxes – a percentage that will become even smaller under Trump's new tax plan. Working Americans, on the other hand, paid $1.79Tn in Income Taxes and another $1.14Tn in Payroll Taxes for a total of $2,930Bn – 7 TIMES more than their Corporate Masters are paying. THAT IS WHAT'S WRONG WITH THE ECONOMY! A simple 20% flat tax (no deductions) on Corporate Profits would generate $1.8Tn a year and still leave them with $7.2Tn to buy a better Government with but at least the rest of us would have a balanced budget – and even enough left over to begin paying down our debts. That's all it takes, one little tweak to the RIGHT Top 0.1% – not the Individuals – but the Corporations! 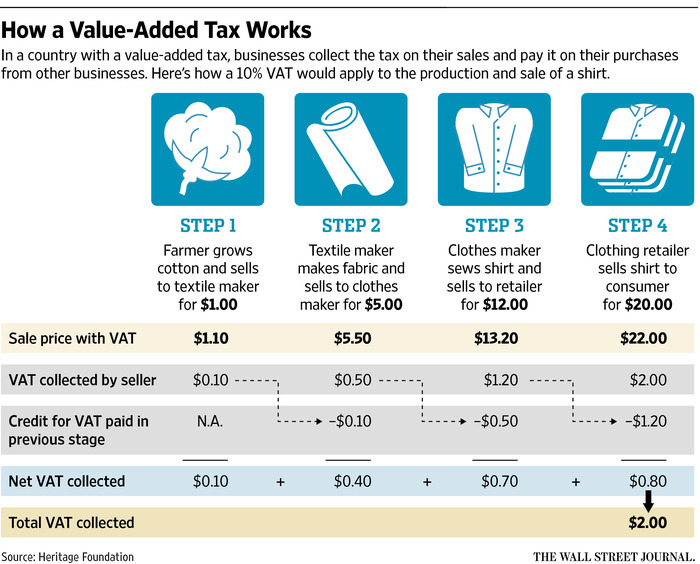 I'm more in favor of a Europe-style VAT Tax on of 25% on all goods and services, which would generate $5Tn in tax revenue in our $20Tn economy and no one would have to pay income tax or payroll tax at all – including Coroprations. So you would keep 100% of the money you make and things would be 25% more expensive at the store. $5Tn is $1Tn more than we need so we could pay off our Government debt in 20 years and that would then save us $400Bn a year in interest payments. Of course, in order not to hurt the Bottom 40%, who won't save any taxes (they don't make enough) but will pay at the counter – we could rebate those 64M wage-earners $4,000 each which would cost us "just" $256Bn but would give them MUCH more money to spend and that money would go right back into the economy anyway – increasing both our GDP and our VAT revenues. There, that's the economy fixed. For my second day in office…. This entry was posted on Thursday, January 17th, 2019 at 8:32 am and is filed under Appears on main page, Immediately available to public, Uncategorized. You can leave a response, or trackback from your own site. Former New Jersey governor and U.S. attorney Chris Christie is pulling no punches in his new book, “Let Me Finish,” unloading on President Donald Trump’s staff in an excerpt obtained by Axios. Yodi / thx for the response on the put spreads. I believe lflan sells the higher strike and goes long the lower strike. I was trying to understand if this type of trade can be applied to any old stock or if you need to choose stocks with more volatility. Bots still seem to be aimed up – that's good. Consolidation around the 50 dmas is also good. Not pausing to consolidate on the way up is why we were so weak at the top in the first place. 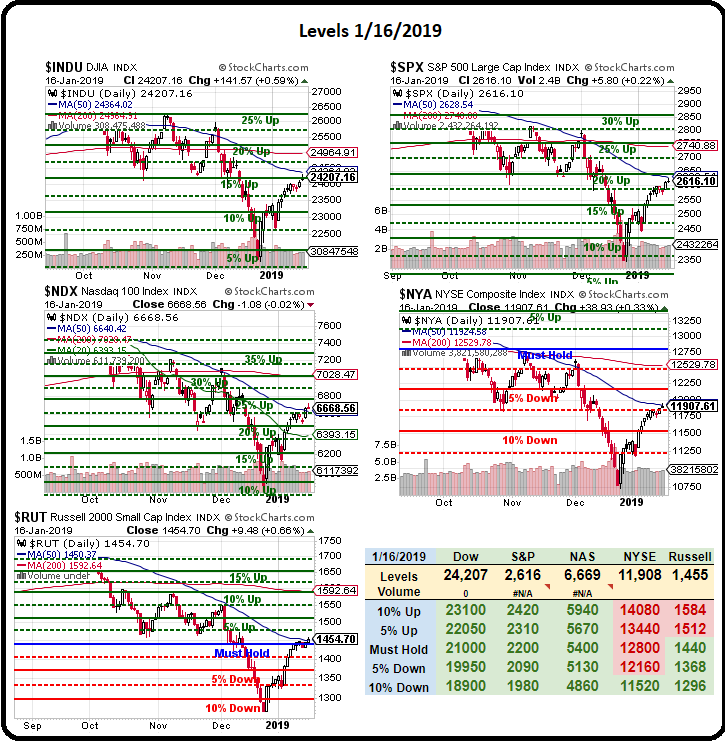 Big Chart – Thanks for the update, StJ! Couldn't be more techical than this – ALL the indexes are pausing at the 50 dmas which are also their strong bounce lines so, if we do get over, the big picture story will be that we had a correction back to the 50 dmas with a slight overshoot but then back on track towards a retest of the 200 dmas later in the year. Bogle/StJ – Great guy, gave half his money to charity on a regular basis – could have been a Billionaire easily if he were greedier. Very loved in NJ – actually lived in the town next to mine at one point. New tax plan — Phil for president 2020! ???? PSW: come for the trading advice, stay for the classic rock. CMG / Phil – I'm looking at selling more of the March $520 Calls - when the stock hits 520 – I currently have sold 25% of what I intend to — Question is, should I sell more of the March 520 or move up to the march 540. I think this stock is overvalued, and it will pull back after earnings. Your thoughts ? Albo – That CTL div should be attracting some buyers at these levels! Not adding to my position, waiting for a trend reversal right now. I have a question- I had a cron spread 10 of 11/11.5 BCS exp tomm. I had 2 of the 11.5 assigned so basically closed out of the spread, bought back the 8 left and sold 8 of the 11 long calls with to 2 left. Since it was heavy in the money I thought I'd let the 2 ride, BUT TD took the 2 long to cover the short position even though there was plenty of money to cover the 2 shorts. They said I had bought 200 shares of cron, which are not in my account to cover the 200 short? Even though it was an 11 long? They did not transfer shares since they said none were available. NOne of this was done on margin and I had sold calls 3X and basically had everything covered. I am down over 2.5K and am surprised that now TD is pulling this. If there wasn't the cash to cover I can see their doing this BUT nothing was done on margin. STJ – One would think. Also, just holding my position. Next dividend will probably be announced in a little over a month. Doing the rock/DC – Just a peek into my thought process. CMG/Batman – We're short around here in the Fund as well but it's a bit dangerous to press ahead of earnings as MAYBE they earned a lot and pop 10% ($50!) so all you do is double your losses AND you'd made the position too big to easily roll. Generally, unless it's to get out of major trouble, I DD on an ASSET and a short call is not an asset, if you are stuck with it you just have a huge short whereas if I'm stuck with a short put – I OWN a lot of a stock cheaply. The March $520s are $28.50 and all premium so I wouldn't roll them as even hitting $550 means you owe back $30 – so no worse than you are now and, if CMG doesn't do great, then you make your -$28.50 back – I'd be thrilled with that myself, not looking to up the exposure into uncertainty. If CMG does pop to $570 and you owe back $50 THEN I'd consider a roll to the June $600s, which are $18 now and the $550s are $33 so figure $33 for the $600s and a 1.5x roll would do it – THAT is when I would DD and still only if I felt the earnings still didn't justify the price. At one point (2015) CMG was at $750 and making $15/share so 50x was extreme but in 2013 they only made $10 so things looked exciting. Last year they made $6.50 and this year $8.50 but if they make $2.50+ in Q4 and project $3/qtr next year then they are back to growing at 50% and then what happens? In 2015 sales were $4.5B, last year sales were $4.5Bn and that was coming off troubles, if they can go back to dropping just 10% to the bottom line that's $450Bn and suddenly their p/e is below 30 at $520 with great growth. TD/Pirate – That is BS and you need to tell them you are unhappy with it and had it under control. Hopefully they will note in your file that you are not just some idiot (most people are) who can't handle a simple assignment in their account. Of course CRON is very volatile and that may put a red flag on open items for them but I find that, if they know you know how to deal with it – they don't tend to get trigger-happy on your behalf. SIG getting spanked today. Might have to watch for a new position. Yeh no shares available on Cron and have to cover immediately because of new regulatory standards. Apparently IAB had to cover millions because they were covering the shorts and didn't have the stock. Apparently more are buying and sitting on Cron! GE – New recovery high. Any reasons to reassess your valuation model? It's currently trading at a P/E of 76. I've got a FY 2018 EPS of $6.72. At the current EPS that makes for a $510 price level. Phil: I'm seeing estimates for Q1 2019 of $2.87, so yes, if they carry on at that run rate throughout 2019 then a FY EPS of $12 at a P/E of 50 takes them to $600 and if people love them so much that they want to pony up $75 for each $1 of earnings then they'll be paying $900. That will take a lot of management to stick with them on that kind of journey. Tommyt – Not yet. I closed out my /NQs this morning, and currently have nothing on. Think it's tough to trade from the short side at the moment, as that appears to be a very crowded trade. We lost about 40% ($40,000) since our 12/11 review – how's that for a turnaround? The OOP is now down for the year so we'll do some triage and see which positions we still believe in. 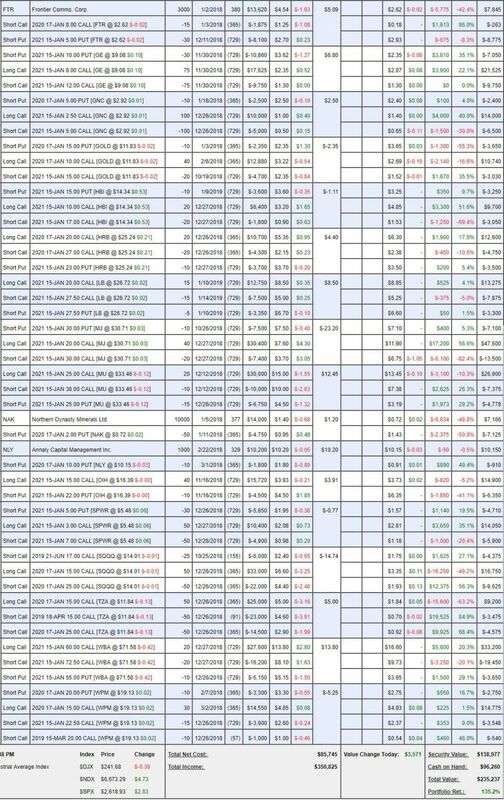 The good news is we still have $132,050 in cash – it's the negative $38,104 value of our positions that is killing us and those are what we like to call "paper losses" but paper losses become realized losses if you aren't careful! There are not all that many opportunities to make big moves like that in the market and, when they do come along, you have to be Ready, Willing AND Able to take advantage of them. Aside from the $132,000 in CASH!!! we had in our portfolio, we also raised another $68,250 by cashing in the long SQQQ calls and that gave us $200,000 to deploy and we used half of it to roll most of our positions into more aggressive ones. So we sell our high vol calls (part one of the roll) and move to a position that has less premium – usually one that's deeper in the money, taking advantage of the stock's low price to establish a deep in the money call with little premium (part 2 of the roll). Then we sell a new call with a high premium or simply don't buy back the current short call – or both. The same goes for the puts, if we can roll our high vol short puts to a longer-term put with even more premium – why not? EVENTUALLY the vol calms down and that's an automatic pay-off for all those new positions. Now, that doesn't mean we ALWAYS do that but, as you all know, we'd been tracking the downturn very closely and I felt very strongly that we were in a panic and we had targeted 20% so we thought we'd at least get a bounce there and, had the bounce failed – THEN we would have added more covers and more hedges but, as it turned out – it all worked out as we predicted – better even as we're now up 135% since last Jan 3rd but, really, we could have sat on the sidelines and waited until Dec 26th to do the whole thing – isn't that crazy? HMNY – Still not BK – that's encouraging! I didn't want to do it last time since we were worried about our other positions but, since it's only $600 to buy another 40,000 shares and drop our basis to 0.07 - why not? JO – Lots of room to run on these. Last March JO was $48 – that would be $20,000 vs our $3,350 current position so I can live with the risk/reward on this one and I do think this is a strong bottom – it's just the time-frame that worries me but we can give it a month. 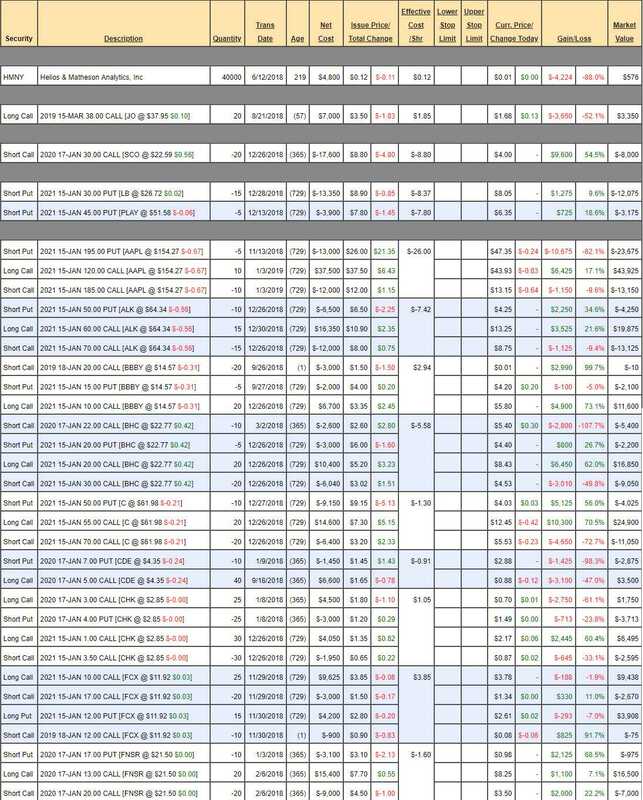 SCO – On 12/26, we had a $14,325 loss on the short Jan $20 calls at $19,575 and we rolled them to 20 of the 2020 $30 calls at $17,600 and now they are down to $8,000 – huge turnaround and we should collect that $8,000 over the rest of the year. LB – Our new puts are on track. Earnings probably first week of March. PLAY – Fairly new position, still good for a new trade with a net $38.65 entry. AAPL – We had the $195 puts and added the rest, puts are $4,000 better and the rest is up $5,000 so nice recovery there already. ALK – We doubled down (and rolled) and they popped over 10% since! BHC – Nice pop already and looking good for our goals. C – Great pop on earnings, very on track. CDE – Still laying around but we cashed ABX and now this is the one we'll work on. CHK – I can't quit them with all the LNG exports and I just read an article supporting my premise that infrastructure is now constraining additional increases in drilling so demand should outpace supply for /NG and that should be good for CHK too. FCX – Good for a new trade. GE/Albo – Told you so! CMG/Winston – I agree with the $12 but I think investors are more aware of the risk now and CMG, rightly, has been concentrating on improving their existing stores and controls and thinking less about expanding but, once they feel confident enough that they have things under control internally, I expect another expansionary push and then I'd suggest the bears get out of their way but that's more of a 2020 thing, not an early 2019 thing. Keep in mind CMG only has 2,500 stores, MCD has 37,000 and even WEN has 6,600 so PLENTY of room to grow once they get back on that path. By the way, while my kids and I thought it was hilarious that people were standing in 1 hour lines for SBUX at DIS and Universal (after paying $100/day to get into the park) – SBUX is another stock you should never short! They have 30,000 stores but that includes 50% of those little thing in every nook and cranny you happen to look at so they could add more very easily but, much more so than that, they are neck and neck with MCD on sales ($24Bn) and profits ($5Bn) but MCD is $138Bn and SBUX is $80Bn so, if MCD doesn't show signs of trading lower – expect SBUX to start trading higher. SBUX can always start serving dinner – a lot easier than MCD can improve their coffee… If I were them, I'd go for small pizzas (have to be good) and craft beer – would fit with their culture. Oh, and I met a guy who is going to be selling THC-infused K-cups – BRILLIANT! Phil / SBUX – Is that a bullish wedge forming on that chart? Ha! Markets popping in recent trade following report that U.S. is considering lifting tariffs on China. Tommyt – A good example of the headline risk in this market ! FTR – We just doubled down on the stock so just waiting for earnings on 2/26. GE – Comeback kids! Was -$2,000 on the 26th, now +$7,900 so another $10,000 turnaround! GNC – We doubled down on our -$6,650 position and now + $2,600 – another +$10,000! GOLD – Silly me, we didn't cash ABX, it changed to GOLD… Still hurting but not so bad but, with CDE there too – we're just watching and waiting and hoping Gold (/YG) gets back to $1,400. Still, this is an earnings report I'll be looking forward to as I think people are way underestimating this company. HBI – Finally turning back up. Hopefully we break through now that we've pressed our position (we also took a very conservative target). HRB – Every year we buy them in the winter and then, around tax season, people remember them and start buying. Good for a new trade. LB – Good for a new trade. MJ – Home run here. We were flattish overall last month and we moved to a way more aggressive position and that has taken off for a quick $11,500 gain but it's a $40,000+ (1/2 covered) spread now net $27,000(ish) so 50% more to gain and I feel very confident – though we will sell short-term calls if we get a good pop for income. This ETF can go 5x over the next few years very easily but will also be a rough ride. MU – Still good for a new trade. NLY – Very range-bound but that's to be expected when you distribute 90% of your profits. We're in this for the dividends, not the stock gains. We just got 0.30/share (3%) on 12/28. OIH – We doubled down on the $15 calls and we were down $9,000 and now down $1,700 so I'd say that's a nice improvement. SQQQ – Let's buy back 1/2 (25) of the 2020 $25 calls for $1.80 ($4,500) as it makes us much more flexible and gives us better coverage. Also, it would be silly not to roll the 50 2020 $15 calls at $3.20 to 50 of the 2020 $12 calls at $4 as we're picking up $3 in position for 0.80 ($4,000). TZA – Amazingly, we're still up on these. 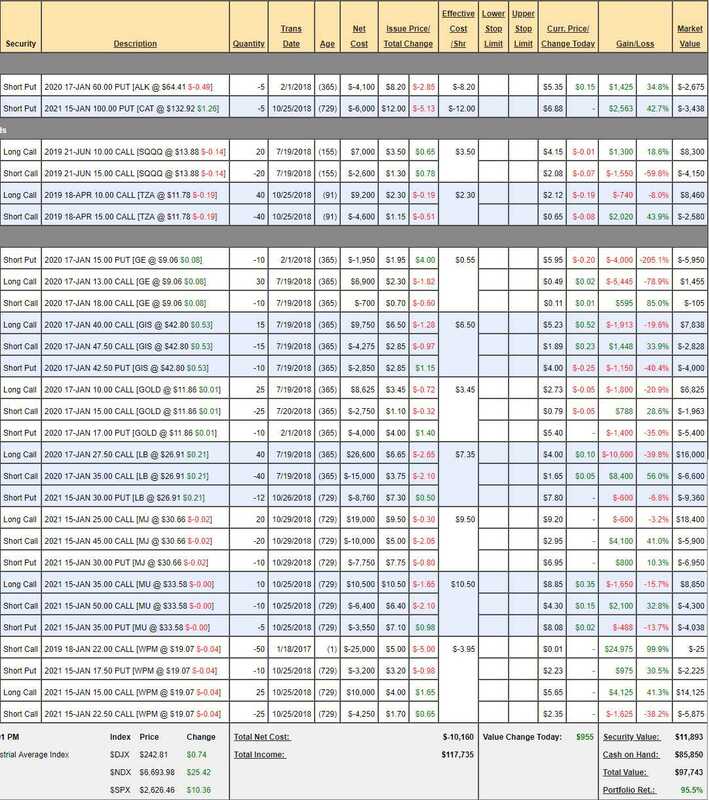 Let's buy back the 50 short April calls as they are just 0.70 ($3,500) and it makes us much more bearish and we'll roll our 2020 $15 calls at $1.70 ($8,500) to the 2020 $8 calls at $4 ($20,000) so we're spending net $15,000 but buying $25,000 in position and now I'll sleep well over the holiday weekend. WBA – We closed the first one with a profit and now this one is off to a great start. WPM – Wisely, we covered as we popped to $20 – very rangebound on this one. SBUX/Soma – It is healthy consolidation for a move up but I think it's more that MCD is overbought than SBUX is under at the moment. Big pop while I was working on the portfolio! Added 3%. Tariff talk/Albo, Ati – More of the same, the Administration can't get its own story straight. Treasury Secretary Steven Mnuchin is reportedly pushing a plan to pull back tariffs on Chinese imports in the hope Beijing will also soften its stance, according to the story. Pushing back against Mnuchin is U.S. Trade Rep Robert Lighthizer. The current deadline is March 1. Past that, tariffs on $200B of Chinese goods are set to jump to 25% from 10%. Markets have moved modestly higher since the news hit a few minutes ago. S&P 500 (SPY +0.6%), Nasdaq (QQQ +0.6%), DJIA (DIA +0.7%). The iShares China Large Cap ETF (NYSEARCA:FXI) has erased an earlier loss, now just barely in the green. Other assets on the move include the Australian dollar (FXA +0.6%). At least this makes it cheap to improve our hedges! What day did you post the THC trade ? Money Talk Portfolio Review: Nothing to say here, it is what it is and we're up 95.5%. I'm on the show a week from Weds so we will be making a few changes then (probably a week from Tues pm I will decide). For now, we're stuck with what we've got and, fortunately, those WPM short $22 calls will be expiring worthless tomorrow. THC/QC – The one in the LTP? That was from back on 9/26 but that one was a double dip from our 1/8 trade – it was one of our first trades in the new LTP because I was loving them down there. We cashed out in late June as I thought $35+ was silly and then they came back to $25 and we started accumulating again in Sept. Nice rangey stock to play with. Add more hedges to lock in gains. So far, we haven't had a break below where we've cashed in our hedges so the STP has made ridiculous gains this year – it's the LTPs insurance policy paying out over and over again – but then it turns out the LTP recovered on its own! So tomorrow I have to do the Butterfly Portfolio and the LTP – Yikes! I really want to trim the LTP down by 20% if possible but, looking at the OOP – there's nothing I don't like. Oops, the point I wanted to make was that, after we add more hedges to lock in gains, we feel more confident picking up lagging bargains on the way back up. That's why, when things are going well – we tend to get position bloat in the LTP. 21 short puts and 57 positions is way too much – especially at review time! Meanwhile, we haven't touched the LTP since Monday, when I snap-shotted it and it's up 6% for the week! I think it's mainly because all our short Jan positions are rapidly losing the last of their premium. Lots and lots of work to do tomorrow! Phil / CMG – Thanks – I'll hold for now…. STJ – This probably accounts for weakness in CTL today. CTL -: Telecom stocks lag within the tech sector; in recent news for co, it yesterday announced that it has added a base in Singapore as its eighth global security operations center, strengthening its service offerings for customers in the Asia Pacific region, and also disclosed that shareholder Aranda Investments has filed for the proposed sale of 16 mln shares. Thanks Albo! Holding on for now and getting paid for it. LTP adustment required on CMG: just a heads up that there are 20 short Jan contracts of the $485 strike which need adjusting by the end of today – the contract closed @ $33.20. The roll for a scratch is to the 15 Feb $505s, or 15 Mar $510s. CMG closed @ $517.66. More of the same as we're up 160 points in the Futures.